Western blot analysis of MCF7 cells, untreated (-) or treated with adenosine-2',3'-dialdehyde (AdOx, 100 μM, 24 hr; +), using Mono-Methyl Lysine [mme-K] MultiMab™ Rabbit mAb mix (upper), and GAPDH (D61H11) XP® Rabbit mAb #5174 (lower). 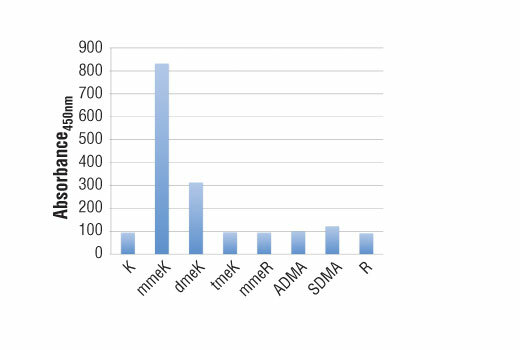 A peptide ELISA was used to determine the specificity of Mono-Methyl Lysine [mme-K] MultiMab™ Rabbit mAb mix. The figure demonstrates that the antibody recognizes mono-methyl lysine and exhibits minimal cross-reactivity to di- or tri-methyl lysine and methylated arginine. Mono-Methyl Lysine [mme-K] MultiMab™ Rabbit mAb mix recognizes endogenous levels of protein only when mono-methylated at a lysine residue. 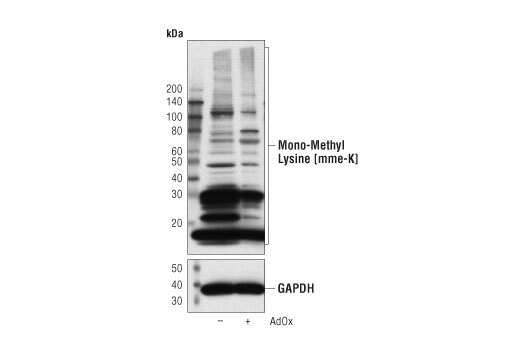 Although this antibody shows minimal cross-reactivity to di-methyl lysine by ELISA, it does not cross-react with endogenous levels of methylated arginine or di- or tri-methylated lysine by western blot. MultiMab™ rabbit monoclonal antibody mixes are prepared by combining individual rabbit monoclonal clones in optimized ratios for the approved applications. Each antibody in the mix is carefully selected based on motif recognition and performance in multiple assays. Each mix is engineered to yield the broadest possible coverage of the modification being studied while ensuring a high degree of specificity for the modification or motif. Methylation of lysine residues is a common regulatory posttranslational modification (PTM) that results in the mono-, di-, or tri-methylation of lysine at ε-amine groups by protein lysine methyltransferases (PKMTs). Two PKMT groups are recognized based on structure and catalytic mechanism: class I methyltransferases or seven β strand enzymes, and SET domain-containing class V methyltransferases. Both use the methyl donor S-adenosyl-L-methionine to methylate histone and non-histone proteins. Class I methyltransferases methylate amino acids, DNA, and RNA (1,2). Six methyl-lysine-interacting protein families are distinguished based on binding domains: MBT, PHD finger, Tudor, PWWP, WD40 repeat, and chromodomains. Many of these display differential binding preferences based on lysine methylation state (3). KDM1 subfamily lysine demethylases catalyze demethylation of mono- and di-methyl lysines, while 2-oxoglutarate-dependent JmjC (KDM2-7) subfamily enzymes also modify tri-methyl lysine residues (4). Most PKMT substrates are histone proteins and transcription factors, emphasizing the importance of lysine methylation in regulating chromatin structure and gene expression. Lys9 of histone H3 is mono- or di-methylated by G9A/GLP and tri-methylated by SETDB1 to activate transcription. JHDM3A-mediated demethylation of the same residue creates mono-methyl Lys9 and inhibits gene transcription (5). Tumor suppressor p53 is regulated by methylation of at least four sites. p53-mediated transcription is repressed following mono-methylation of p53 at Lys370 by SMYD2; di-methylation at the same residue further inhibits p53 by preventing association with 53BP1. Concomitant di-methylation at Lys382 inhibits p53 ubiquitination following DNA damage. Mono-methylation at Lys382 by SET8 suppresses p53 transcriptional activity, while SET7/9 mono-methylation at Lys372 inhibits SMYD2 methylation at Lys370 and stabilizes the p53 protein. Di-methylation at Lys373 by G9A/GLP inhibits p53-mediated apoptosis and correlates with tri-methylation of histone H3 Lys9 at the p21 promoter (1,6). Overexpression of PKMTs is associated with multiple forms of human cancer, which has generated tremendous interest in targeting protein lysine methyltransferases in drug discovery research. Lanouette, S. et al. (2014) Mol Syst Biol 10, 724. Clarke, S.G. (2013) Trends Biochem Sci 38, 243-52. Herold, J.M. et al. (2011) Curr Chem Genomics 5, 51-61. Thinnes, C.C. et al. (2014) Biochim Biophys Acta 1839, 1416-32. Klose, R.J. et al. (2006) Nature 442, 312-6. Yost, J.M. et al. (2011) Curr Chem Genomics 5, 72-84.